Kullaberg is in Scania of Sweden. Kullaberg is a nature reserve in the Kullabygden region in Scania. It is known for its climbing possibilities - one of the few places to climb in Scania, nice hiking, and a golf course. It's also home to a controversial series of giant driftwood sculptures, and their related micro-nation, Ladonia. Parts of the park are off limits part of the year because of rare birds nesting in the area. There are usually signs put up but you might want to check in the center before you start hiking in the area. Kullaberg is only 1½ - 2 hours drive north of Malmö. From Helsingborg it is little less than 1 hour. Take the bus to Mölle and walk from there. (As of Sep 1, 13) From Helsingborg C (Knutpunkten), take regional bus 222 to Mölle bus station (last stop). Depending on the timing, change at Hoganas might be necessary. The journey shall then be bus 220 either from Knutpunkten or Ramlösa to Hoganas (last stop) and bus 222 to Mölle. Ticket can be bought from the bus driver with bank cards. One way costs 57 SEK including transit. No return ticket is available. From Mölle, just follow the signs and walk up the hill. Entering Kullaberg by car is free since spring 2010. Before that it carried a cost of 40 SEK ( 4 Euro ) a day. You got a ticket on the way in and payed on the way out. Card payment was possible. There are three different parking lots where you can park your car. After that the only way to get around is on foot. Nimis and Arx - Gigantic beach art structures built by Lars Vilks with wood found on the shore. Ladonia (Swedish: Ladonien) is a micro-nation, proclaimed in 1996 as the result of a years-long court battle between the artist and the local authorities over the two sculptures. As Nimis' existence is not sanctioned by the state, it can be a bit difficult to find. There are no official sign posts, nor is it marked on maps. It lies a few kilometres northwest of the town of Arild and somewhat farther from the town of Mölle, and can only be reached on foot following a well-worn path with yellow "N"s painted on trees and fences. 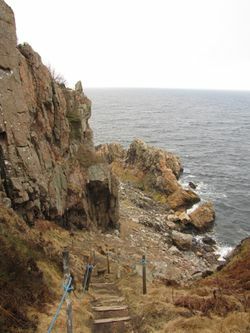 The path begins as an easy stroll past Himmelstorp, a well-preserved eighteenth-century farmstead that sells teas, ices etc, but quickly becomes a steep and rocky climb down to the coast. Lighthouse - A very picturesque lighthouse is located at the parking lot furthest away. Caves - There are several caves in the nature reserve, the most wellknown are Silvergrottan (Silver cave) and Visitgrottan (Visit cave). Naturum - This is an information center where you can learn more about the history and nature of Kullaberg. The entry is free. The climbing in Kullaberg is the most wellknown in Scania. Read about it here. There is a golf course. Be careful not to hit the climbers. Kullaberg has lots of scenic views and is very beautiful to walk around in. There are well-marked trails along the northern and southern shores, with a number of connecting trails across. The trails are fairly easy, although you should keep track of your children as the drops are significant at times. The Blue trail is significantly harder with a lot of ups and downs to hike, although it gives you some very beautiful viewpoints. The two main hiking trails have together three signposted detours leading down to the caves (or rather, grottoes) by the coast. The paths leading to the caves are steep and difficult to walk due to loose stones. Ropes are affixed to the sides of the paths to make the descend easier. There are several diving schools in the region which will let you take your diving certificate just off the shore of Kullaberg. The Naturum by the lighthouse has free cold and hot water, as well as coffee for a small fee (15 SEK). If you did not bring your own bottle or cup, you can buy one there. Also, there is a large hotel at the first parking lot where you can eat and drink. Food is affordable starting at 90 SEK ( 9 euro ). Beer prices are similar to the rest of Sweden. In addition, there is also a kiosk where you can buy candy and drinks. Flickorna Lundgren på Skäret, Skäretvägen 19, 260 41 Nyhamnsläge, tel. 042-346044 . Coffee, cake and sandwiches. Don't miss it if you have a sweet tooth! Stay at hotel Rusthållargården in Arild, close to Kullaberg . You can stay at the hotel in the nature reserve  or at a hotel in Mölle. Camping is not allowed in the nature reserve. Not far from Mölle there is a camping site which also has cabins and huts you can rent. Be careful when hiking in the area, about once a year someone falls from a cliff and gets hurt pretty badly. Also be careful when climbing in the area, 5 climbers have lost their lives when climbing in Kullaberg since the sixties. Several paths and hiking trails cross the golf course, a golf ball to the head can be fatal so please watch for golfers before you cross the course. This page was last edited on 13 September 2018, at 08:18.